Aircraft grade Aluminum Keymod Adaptor Base and High-tensile Steel QD Sling swivel. Be able to Put Keymod Attachments Anywhere You want lockdown Nice and Secure. Non-rotational Design.Makes it enough duable. Steel locking nuts and screw.Not easy bent or broken when you tightened them. 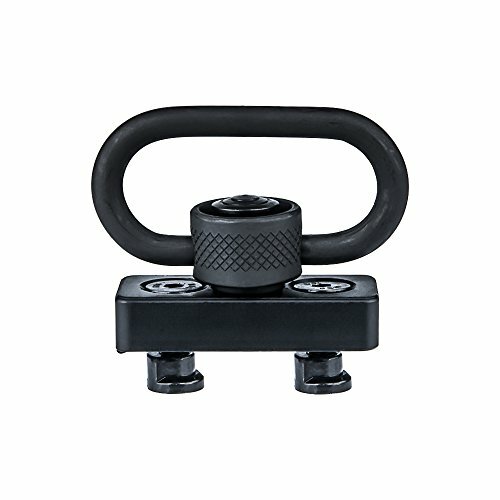 SOLID CONSTRUCTION:Heavy-Duty QD Sling Swivel made from high-strength steel,Keymod Standard adaptor Machined from aircraft grade aluminum with matte black hard coat anodize. Attached Securely to KeyMod Handguard Rail-Produced Precisely Fits Standardized KeyMod Interface Mounting Holes and Come with High Strength Steel Screw and Nut. Push Button Swivel Quick Detach Easily and Locks in Several Positions- It locks into 8 positions so your sling will always be oriented the correct way without twisting. Low Profile and Lightweight mount,Push Button QD Sling Swivel Fits 1.25 inch Webbing or Paracord Rigging or Weaving, Gun Sling Sports and Outdoors Applications. If you have any questions about this product by Omamba, contact us by completing and submitting the form below. If you are looking for a specif part number, please include it with your message.